Alfa Laval doesn’t do average. Whether it is our multi-purpose Industrial range; the Semi-welded industrial range for refrigeration and exacting processes; the Hygienic range for food, beverage and pharma applications; or the Specialized range for condensation, evaporation and fibrous media – you buy into reduced cost of ownership and increased efficiency and safety. Our Gasketed plate heat exchangers are optimizing heat transfer by large surfaces of corrugated plates drawing heat from one gas or liquid to the other. The high efficiency and an outstanding reliability in a compact design, offers an investment with the most attractive CTO over the product life time. Not to forget the energy saving capabilities and low environmental footprint. Our wide range of industrial gasketed plate heat exchangers is suitable for all types of industry and multiple applications from heating, cooling and heat recovery to condensation and evaporation. 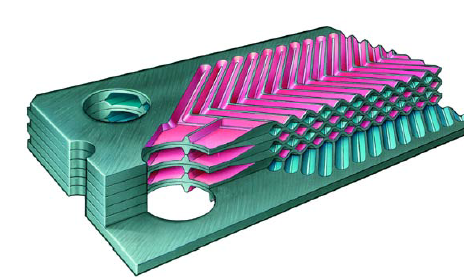 The design of the corrugated plates optimizes heat transfer by providing a large but compact total surface area through which the heat can be drawn from one liquid or gas to another. The heat transfer area of the plates is pressed in a corrugated herringbone pattern. When two plates are superimposed with opposing herringbone patterns, the helix-like flow and high turbulence results in high transfer coefficients and effective self-cleaning. 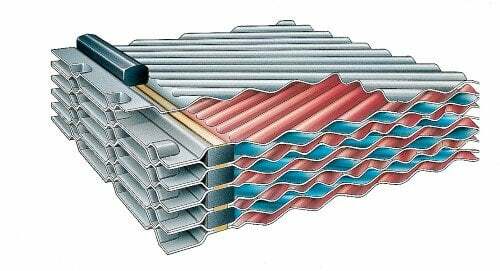 A change in the corrugation pattern enables the heat exchanger to be used in different processes, even those with very dirty media. The plate distribution area ensures an even flow of fluid over the entire plate to maximize the heat transfer capability. An optimized flow distribution also reduces fouling and uneven temperature zones keeping the performance levels high over time without unnecessary energy losses, maintenance costs or unplanned stops. Gaskets are key components in heat exchanger performance. 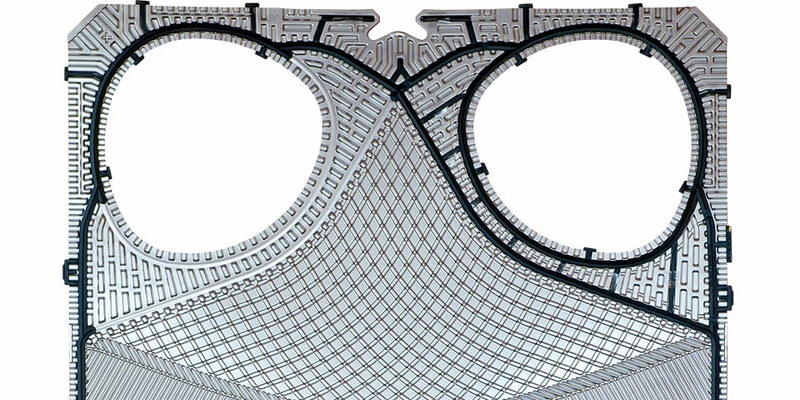 We design the gasket and plate as one to assure an optimized seal. Each is tailored to the duty of the heat exchanger. The correct profile, width, thickness, and polymer type and compound make a world of difference in avoiding the risk of premature leakage or gasket or plate damage. Your benefits are prolonged gasket life, less downtime and lower maintenance costs. Designed for use with fluids that cannot be allowed to mix. Prevents leaking fluid coming into contact with the fluid in the other circuit. Ideal for fluids containing fibers or coarse particles. Designed to eliminate bridging of solids in the entrance area. Enable aggressive and difficult fluids to be handled, and also extend the pressure range. A composite of fused graphite and fluoroplastic provides excellent resistance to corrosive materials. The concept behind a heat exchanger is relatively simple – heating or cooling one medium by transferring heat between it and another one. In a gasketed plate heat exchanger, the plates are fitted with elastomeric gaskets which seal the channels and direct the media into alternate channels. The plate pack is assembled between a frame plate and a pressure plate, and compressed by tightening bolts fitted between these plates. The channel plates and the pressure plate are suspended from an upper carrying bar and fixed in position by a lower guiding bar, both of which are fixed to the support column. The design allows easy cleaning and simple capacity modification (by removing or adding plates). 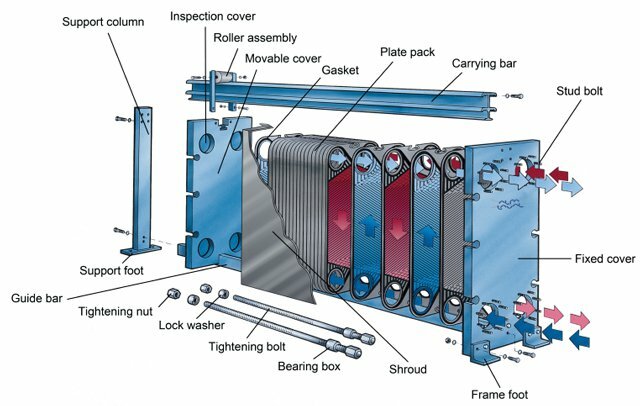 The heat transfer area of a gasketed plate heat exchanger consists of a series of corrugated plates, assembled between a frame and pressure plates to retain pressure. Gaskets act as seals between the plates. Fluids normally run counter-currently through the heat exchanger. This gives the most efficient thermal performance and enables a very close temperature approach, ie the temperature difference between the exiting process medium and the entering service medium. For heat sensitive or viscous media, co-current flow can be used to let the coldest fluid meet the hottest when entering the heat exchanger. This minimizes the risk of the media overheating or freezing. Plates are available with various pressing depths, angles of chevron pattern and various corrugation shapes, all carefully designed and selected to achieve optimal performance. Depending on the application, each product range has its own specific plate features. The distribution area ensures fluids are evenly distributed across the entire heat transfer surface and help avoid stagnant zones that may cause fouling. While high flow turbulence between plates results in higher heat transfer, the consequence is pressure drop. Our thermal design engineers can help you design and select the model and configuration that is suitable for your application so that it delivers maximum thermal performance with minimum pressure drop.